Envisioned as a retreat from city life modeled on seventeenth- and eighteenth-century European gardens, the Dumbarton Oaks Gardens have grown into an oasis for the public and for scholars since the Blisses donated their estate to Harvard University in 1940. The changing history of the Ellipse, one of the enclosed gardens, demonstrates the exemplary level of attention paid to design and design change, which typifies the efforts channeled into the creation of the grounds. Likewise, the Vegetable Garden has also played an important role in Dumbarton Oaks’ history, functioning as a method of community outreach in the 1940s and returning to that role more than fifty years later. For the enclosed garden known as the Ellipse, Farrand conceived an oval of closely planted box hedges surrounding a simple water feature basin with a single jet of water at play. Called the Box Ellipse, this garden was meant to offer tranquility and privacy with only one entrance/exit point and no vistas beyond the box hedge. By the late 1950s, however, the box had become overgrown and unwieldy. It was then decided that this garden should be redesigned under the supervision of Alden Hopkins, consulting landscape architect at Dumbarton Oaks between 1956 and 1959. The original boxwood hedges were replaced with hornbeam trees, forming an aerial hedge that allowed views into the surrounding areas. Extensive correspondence from the period of renovation between Alden Hopkins, director John Thacher, Beatrix Farrand, and Mildred Bliss, among others, reveals the level of detail that accompanied these plans. Detailed clearing, planting, and construction specifications abound, as the correspondents discussed changes ranging from plumbing adjustments to construction materials, from fountain water level to proposed grass length. Mildred Bliss, in particular, closely oversaw the remodeling of the Ellipse, managing details down to the color of the decorative pebbles lining the pathway. In 1960, under Ralph E. Griswold, consulting landscape architect at Dumbarton Oaks beginning in 1960, the original water feature with a single-jet fountain, was replaced by one of a more modern design, and two curved stone walls with moats were added to the design. 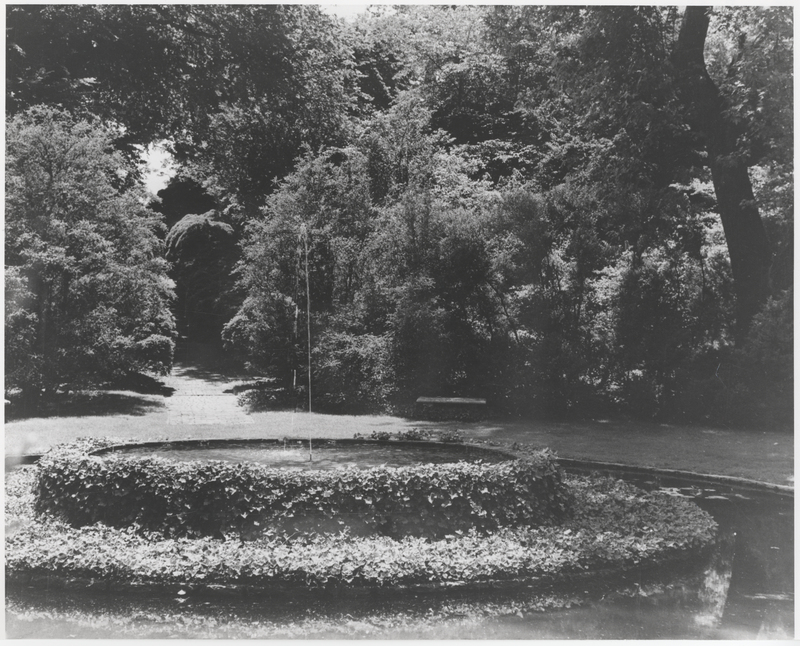 However, Mildred Bliss found this change unsatisfying and, in 1967, the walls and moats were removed and the water feature was replaced by the French eighteenth-century Provençal fountain that had been removed from the Copse due to the construction of the Philip Johnson–designed Pre-Columbian Pavilion. After the 1940 gift of Dumbarton Oaks to Harvard University, however, there was increasing ambivalence toward the Kitchen Gardens. In a 1944 letter to Mildred Bliss, Beatrix Farrand wrote that “the vegetable garden, while useful, does mean a considerable amount of work, and taking all of these various elements into consideration it would seem wise to omit vegetable growing for one year at least as an experiment.” To this end, vegetable cultivation at Dumbarton Oaks was halted in the mid-1940s, with the conclusion of the Second World War, and the pit house was interred in 1949. However, the space was never fully redeveloped. The frame yard area became a peony nursery and the remainder was covered with landscape fabric and used to grow potted mums that would be relocated in the fall to the perennial borders. Recently, however, Gail Griffin, director of gardens and grounds since 1997, has reinstated the Kitchen Gardens. Its revival was first conceived as a community project involving volunteers, but after the volunteer force was disbanded in 2009, the responsibility for the organic vegetable garden has been taken over by the garden staff. The pit house has been excavated, and there are plans for its restoration. Moreover, a recent donation has provided the funds to plant additional cherry and crabapple trees, among others. Griffin plans to allow the gardens to continue to evolve. As she mentioned in a 2013 interview, “I think it’s unrealistic to expect a garden not to change, and it takes a lot of the fun out of gardening to try to slavishly follow one design. But I do feel that, in order to make particularly significant changes, it is important to understand what [Mildred Bliss and Beatrix Farrand] were envisioning.” This continued loyalty to their design honors the vision of the garden’s creators, retaining the timeless beauty of the gardens while offering longtime visitors imaginative new displays. 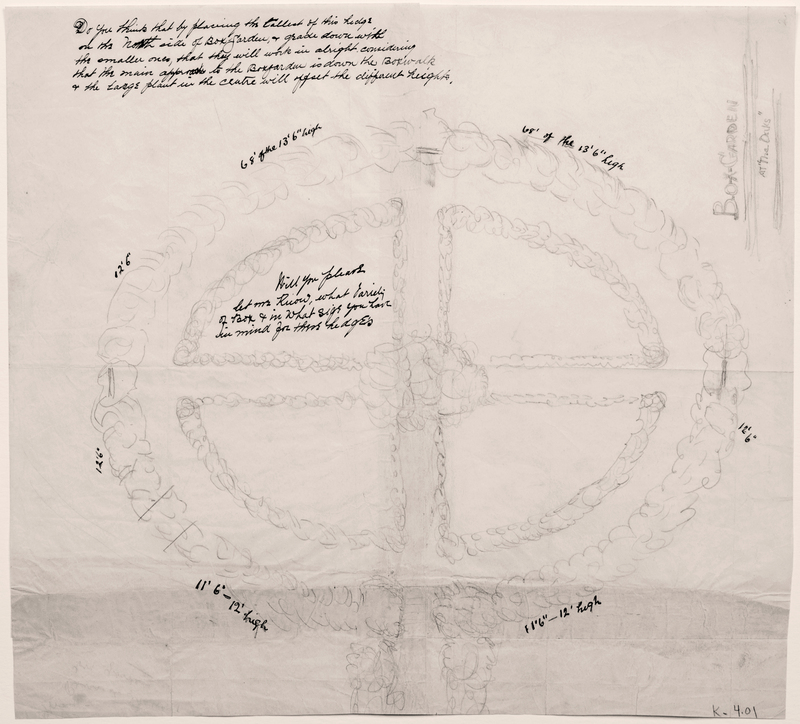 More archival images and drawings of the Ellipse and Kitchen Gardens are available in the Dumbarton Oaks Garden Archives.